It is more than appropriate to start this blog with a post about my dad. “I don’t like to cook, I like to eat,” he’d say to us as he lovingly coaxed a roux out of butter and flour. My dad would take detailed, seemingly complicated recipes from Food and Wine Magazine and turn them into weeknight dinners. One of our favorite things Dad ever made us, however, was hardly a culinary masterpiece. It was–for all intents and purposes–a glorified use of leftovers. As a big fan of making his own stock, my dad would find himself with a whole, tender chicken that had been boiled until the bones had sacrificed all the flavor they could. When we saw a mangled, boiled chicken carcass on the kitchen counter, we knew chicken salad was on its way. The chicken is not chopped, cubed, or shredded. It’s torn. By hand. And that–plus the miraculous ingredients of hard boiled egg, shallot and dill relish, among others–makes all the difference. 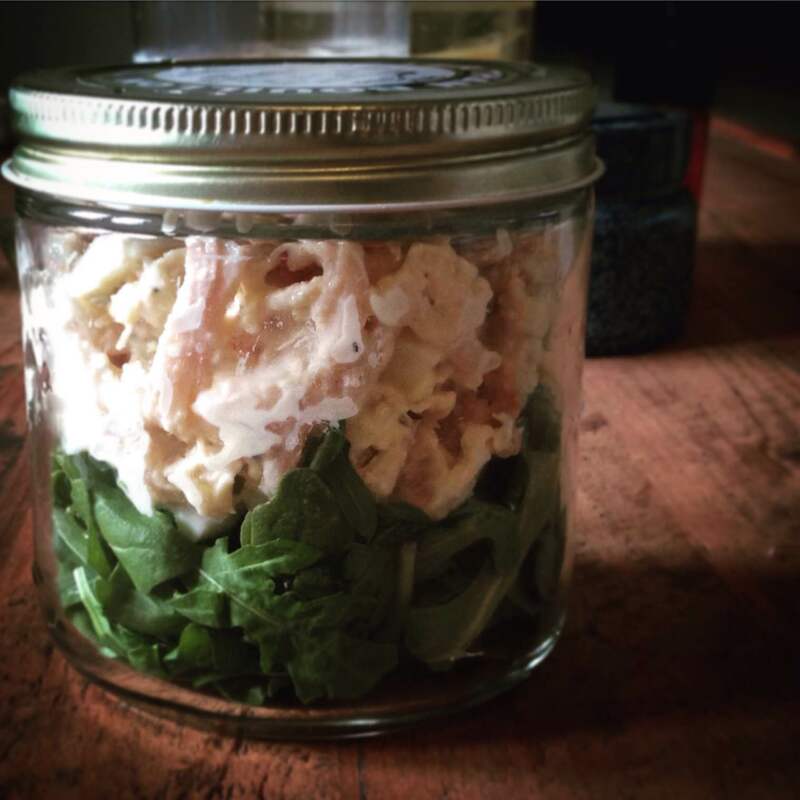 When we were kids, Dad’s chicken salad was kept in a glass bowl with a plate on top on the bottom shelf of the fridge and it never lasted more than a day or two. My sisters and I would grab the bowl and sit at the breakfast room table with a sleeve of Saltines until it was gone. I made the chicken salad yesterday and found that my “everything” crackers from Trader Joe’s provided a more than satisfactory backdrop. And a little arugula added spice and texture to a pretty outstanding trip down memory lane.